Indulge in Boston's brewery scene on morning and evening tours that include upwards of 15 beer tastings, lunch or dinner. Learn about the history and mechanics of brewing beer, and visit venues that may include Sam Adams, Cambridge Brewing Company, and The Meadhall. If you choose the evening tour, you'll get a chance to learn about a group of small beer-making operations that make up Boston's nanopub scene. No matter what option you select, expect to make new friends, sample a wide variety of beers and relax knowing you have a designated driver. 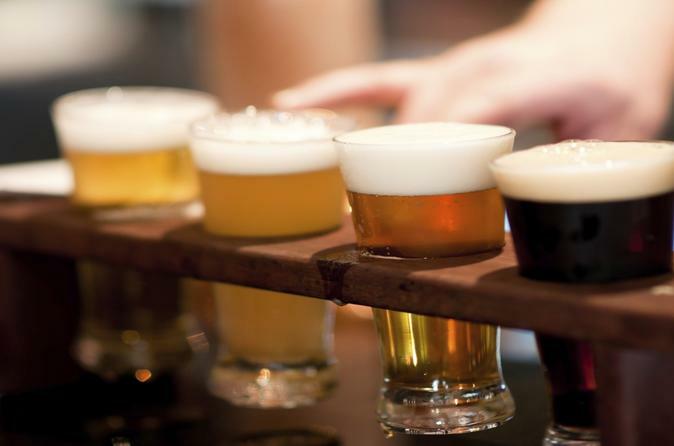 Immerse yourself in Boston's lively beer scene on guided morning and evening brew tours. Chat with brewery owners as you explore the equipment used to make beer, learn about the brewing process, and sample all kinds of suds! See below for details on each tour. Meet your guide in downtown Boston in the morning, and travel by comfortable bus to four different Boston breweries. Let your guide introduce you to award-winning pilsners, stouts and other beers and explain the history and specialties of each brewery you visit. The locations vary depending on the day you take your tour. Sam Adams, Cambridge Brewing Company, Night Shift, Mystic Brewery, Downeast Cider or Beer Works are among the breweries you might go. A visit to Sam Adams reveals how the popular label uses artesian imported hops and fresh malt. Cambridge Brewing Company, the oldest brewery-restaurant in the Boston area, offers up sips of handcrafted, award-winning beers. Agave nectar, pink peppercorn and habanero peppers are among the unusual ingredients that might tickle your taste buds in Night Shift's concoctions. All tours stop at The Meadhall, a gastropub where you'll see more than 100 beers from all over the world on tap, take a private behind-the-scenes tour, and enjoy lunch with your beer. Your brew tour concludes in downtown Boston in the afternoon. Focus on the nanobrewing, or nano, scene in Boston on this tour that includes some 15 different beer tastings. Nanobreweries are small beer-making operations that make a few batches at time. Supplies are limited, and they usually go fast! Talk with the owners about their labors of love at four breweries that may include Beer Works, Night Shift Brewing, Idle hands, Mystic Brewery and Cambridge Brewing Company. You might try Belgian-style beers at Idle Hands, Boston's first nanobrewery, or a saison ale at Mystic Brewery. Your evening tour concludes in downtown Boston.